The doe’s reappearance marks a stunning turn in an already astounding journey that began in 2016. That’s when biologists studying the Red Desert-to-Hoback mule deer migration corridor noticed something odd in their GPS tracking data. Deer No. 255 had wintered near Superior, then migrated to the Hoback Basin. By itself, this 150-mile migration to the west slope of the Gros Ventre Range is the longest-distance deer corridor recorded in America. Biologist Hall Sawyer originally documented the Sublette herd’s use of this corridor in 2013. But, unlike the other deer that settled in at the Hoback Basin for the summer, doe 255 kept migrating, circling around the western edge of the Gros Ventre Range toward Jackson Hole. She trekked across the head of Cache Creek, a popular outdoor playground upstream from the town of Jackson. Soon after, the deer crested a 9,800-foot pass between Nowlin Peak and Jackson Peak, the highest point on her entire route. From there, she crossed forested ridges and dropped into the Gros Ventre River valley to scoot around the east side of Slide Lake. Passing the Red Hills, deer 255 intersected with the Path of the Pronghorn. While other mule deer, elk and pronghorn have historically migrated from the Green River Basin to this part of the Gros Ventre River, very few animals have been documented to begin the journey so far away in southern Wyoming. Then, to the further surprise of biologists who were by now watching her every move, deer 255 kept going. She passed west of the Mount Leidy area, continuing on to Moran Junction, Emma Matilda Lake and Pacific Creek. One of her GPS fixes was three-quarters of a mile from the entrance to Jackson Lake Lodge. Reaching the north end of Jackson Lake, the doe turned west to parallel the Grassy Lake Road. She pointed her nose over the low northern crest of the Tetons, threading the John D. Rockefeller Jr. Memorial Parkway, the Jedidiah Smith Wilderness, the Winegar Hole Wilderness and the southwest corner of Yellowstone National Park. From there, she crossed the Falls River and entered the Henry’s Fork caldera, finally reaching her summer range and ending the migration. It was June 15, and the doe was standing in woods on the outskirts of Island Park, Idaho. This two-square-mile patch of meadows, wetlands and lodgepole pine was the habitat she’d been migrating toward since March 20. She was 242 miles from where she’d started in southwest Wyoming. That made it the longest-distance spring migration route ever documented in a mule deer, through a wild region of private and public lands with some of the most intact migratory landscapes in the American West — if not the world. Among North American ungulates, only caribou migrate farther. The UW biologists were dumbfounded, but they suspected that this mule deer might just be a “dispersal,” an animal that had left its usual migration corridor to establish a new home range with a different herd in Idaho. Mule deer have the highest fidelity to their migration corridors of any Wyoming ungulate, yet such departures, while rare, do happen. To see if this path was actually an established migration corridor for deer 255 and others she may travel with, the biologists would have to watch if she would follow the same course again. The GPS collar she was wearing would keep collecting data for another two years. All they had to do was wait and see if she would return to the Red Desert winter range in the fall, and then repeat the journey to Idaho again in spring 2017. But then, in August 2016, those plans fell apart. The doe’s collar malfunctioned, and her signal went dark: complete radio silence. That left biologists with little hope of ever finding her again. “August 7 — I will never forget that day,” says UW graduate student Anna Ortega, recalling when the doe’s GPS collar went off the air for an unknown reason, no longer uploading its location via satellite to her computer at the Wyoming Cooperative Fish and Wildlife Research Unit at UW in Laramie. The fall of 2016 passed, as did another spring and another fall, with no sign of the deer. Hoping that 255 had migrated south, Ortega requested that pilots flying winter surveys search the corridor for a VHF radio signal from the doe’s collar, but nothing turned up. Through the summer field season of 2017, Ortega tried to tune into the doe’s collar signal so many times that she memorized the serial number and radio frequency. 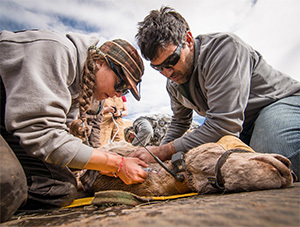 In March 2018, Ortega and collaborators with the Wyoming Game and Fish Department (WGFD) were recapturing collared mule deer in the Red Desert. The work is part of her master’s degree research on how the long-distance migration strategy benefits the productivity of the Sublette herd. As part of the captures, Ortega and U.S. Geological Survey wildlife biologist Matthew Kauffman, who leads the study, advised the helicopter crew to bring in any deer with brown GPS collars, a model that had been known to malfunction. Helicopter pilot David Rivers spotted a few deer with brown collars, and his crew brought the animals back to a staging area where the biologists collected data on each animal. When one of the deer came in, Ortega read its serial number — and her heart jumped. After three migration seasons searching in vain for deer 255 that vanished in Island Park, she could hardly believe it: This was the lost deer. Twenty months had passed since the doe’s GPS signal had blinked off beyond the Tetons on summer range. And now, in March 2018, the capture crew members had relocated deer 255 roughly a dozen miles from where they’d first found her on winter range two years and a day earlier. The lost deer had resurfaced, against all odds, thanks to the sharp eyes of the helicopter crew and the serendipity of staging their captures a little farther north along the migration corridor than usual. Doe 255 was already migrating, and they’d captured her close to Steamboat Mountain and her first stopover of the season. A wildlife management coordinator based in Green River, Zornes manages the Sublette herd on its southernmost winter range. The WGFD is one of the first state wildlife agencies in the West to develop conservation policies to sustain long-distance migrations like this one. “It’s pretty crazy when you throw another 100 miles on top of the longest mule deer migration,” Thonhoff says. Deer 255 traverses an area of Jackson Hole where Grand Teton National Park biologist Sarah Dewey has previously documented migration corridors running west to Idaho, south to the Green River Basin, and east to the Wind River and the Shoshone River. As wildlife research supervisor with the Idaho Department of Fish and Game, he’s currently working with Grand Teton National Park to document migrations across the border between Idaho and Wyoming. Biologists still need to collect another year of movement data to confirm that the Island Park doe makes an annual trek from Wyoming to Idaho. Ortega and her crew placed a new satellite collar on the deer, and they will be watching closely this spring to see if 255 makes the same incredible migration from near Interstate 80 to the far side of the Tetons. For Ortega, deer 255 has become a fixation. She checks in on the deer’s location every day, making sure the doe is still going about her daily movements and watching for further signs of spring migration. With luck, 255 will migrate again to Idaho and give birth to a fawn to whom she will teach this same unique migration route, passing it on to the next generation. Previous research at UW has shown mule deer are highly selective browsers that migrate to follow the “green wave” of spring forage as it moves up in elevation, maximizing their nutritional gains, reproductive success and ability to withstand the rigors of winter. Yet, it’s still unclear what attracts deer 255 all the way to Island Park, elevation 6,300 feet. According to Hurley, the area has few aspen and not much shrub cover, qualities that are found in other more productive mule deer habitats farther south in Idaho. Perhaps the deer gets a nutritional benefit from her habitat in the well-watered Henry’s Fork caldera, an 18- by 23-mile-wide basin created when the Yellowstone supervolcano violently exploded 1.3 million years ago. Today, the caldera receives 30 to 60 inches of precipitation a year, making it one of the wetter spots in the region. The area can have more snow in winter than Jackson Hole and stay green long into the fall, Hurley says. Ortega’s research could shed light on what long-distance migrators — such as 255 — gain from making such long treks to summer range. As for the doe’s winter range, the wind-blown mesas near Superior are some of the driest areas in Wyoming, relatively mild places for mule deer to spend the cold season without much snowfall to contend with. The migration study is a collaboration among UW, WGFD, Wyoming Migration Initiative, Bureau of Land Management and U.S. Geological Survey, with funding from the Southwest Wyoming and Upper Green chapters of the Muley Fanatic Foundation, National Science Foundation, Robert Berry Ecology Center Endowment, Pew Charitable Trusts, the Wyoming Landscape Conservation Initiative, the Wyoming Governor’s Big Game License Coalition and the Knobloch Family Foundation. 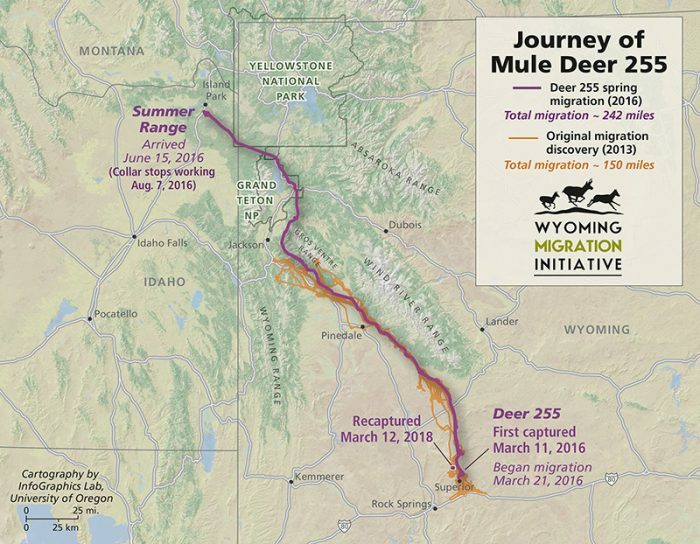 Cartographers at the University of Oregon InfoGraphics Lab have worked with the Wyoming Migration Initiative to tell the story of this world’s longest mule deer migration since 2014. The two groups collaborated to produce “Wild Migrations: Atlas of Wyoming’s Ungulates,” a definitive, richly illustrated book of maps, science stories and images that will be published by Oregon State University Press in October. Learn more at www.migrationinitiative.org.